By utilizing the Sound Magic Hybrid Modeling Engine, Piano One offers both the Realistic Sound of Sampling and the Playability of Modeling. Hybrid Modeling provides an instantaneous feeling – no delay – and a truer and richer sound than canbe created with either sampling or modeling alone. What’s more, Piano One utilizes only 150MB, which is quite a small footprint, making Piano One usable even on older PCs. There is no waiting time when loading and the CPU usage is so small that it’s virtually unnoticeable. Like other great pianos from Sound Magic. 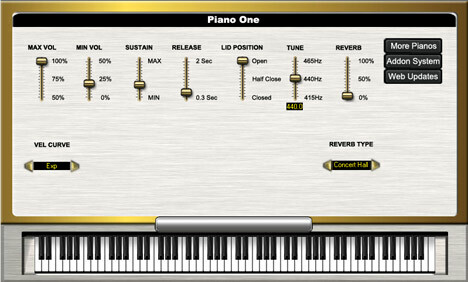 Piano One is equipped with a full featured Add-on system which enables you to enhance Piano One with over 20 different add-ons from the Sound Magic Online Add-on Store. Add-ons add different special features to Piano One. They can make your life a little easier, letting you quickly and precisely modify your sound, your style and much, much more. These add-ons are all precision designed with a particular purpose or for a particular style of music.It’s also possible to choose a completely different piano sound when you simply feel you need a new color or a new style.